Registration to the School closed Feb. 15, 2013. No fee refunds after Feb. 15. All students admitted to the Summer School should have received the letter of admission by Jan 15, 2013. The summer school school will include lectures on mathematical epidemiology, and one of the most important aspects will be projects for groups of 46 students, mixing scientific backgrounds and levels of experience, and focusing on real-world problems around which students develop and analyze models. 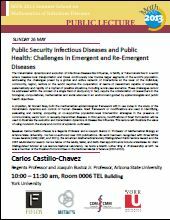 It will also incorporate several lectures on public-health topics with focus on those relevant to other events of MPE2013 such as global spread, Indigenous populations health, vector-borne diseases and integration of surveillance, statistical data analysis and dynamical modelling and simulations. The goals of the Summer School are to encourage more developing scientists to become interested in this field and to encourage communication between mathematical modellers and public health scientists and epidemiologists who have been historically unaware of the uses of mathematical modeling. Lecture notes of the summer school will be available to those admitted and confirmed students before the School. A set of notes, prepared by Professor Fred Brauer, is posted on line at the Centre for Disease Modelling (CDM) webpage http://www.cdm.yorku.ca/rev2.pdf. These notes by Professor Brauer are intended for students or workers in biological sciences, epidemiology or public health who may have learned elementary calculus and differential equations, possibly in the distant past and possibly in a form that did not convince them that mathematics could be useful in their chosen field. We have tried to present some basic mathematics to make it possible for "calculus victims" to become " calculus users" in biology and epidemiology. Professor Brauer will be available to provide tutorial on May 18th, 2013. Students will be accommodated at York's student residences during their stay and more information will follow. Students can also choose to stay at the Executive Learning Centre, see http://elc.schulich.yorku.ca/SSB-Extra/elc.nsf/docs/Guests. The School is designed for students coming from mixed backgrounds. We anticipate graduate students in epidemiology and public health, medical residents and graduate students in interdisciplinary sciences programs, in addition to graduate students in computational, mathematical and statistical sciences. Fees: Faculty/Researcher: $600, Students $100. May 19: Introduction to the school; Basic epidemiology; Basic deterministic SIR and SIS models; Simple case study. Reception, plus each student gives a short presentation of their research work and interests. May 20: Stochastic models; Calculation of the basic reproduction number. Presentation of projects, Tour of labs and software. May 21: Metapopulation models; Network models. Form groups and discuss projects. May 22: Parameter estimation; Statistics and public health data. 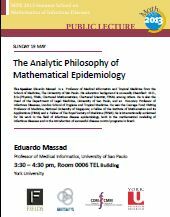 May 23: Public lectures; Structured population models for infectious diseases. Tour of the Fields Institute. Case-study: disease spread and global travel. Group project preliminary presentation, group discussions.